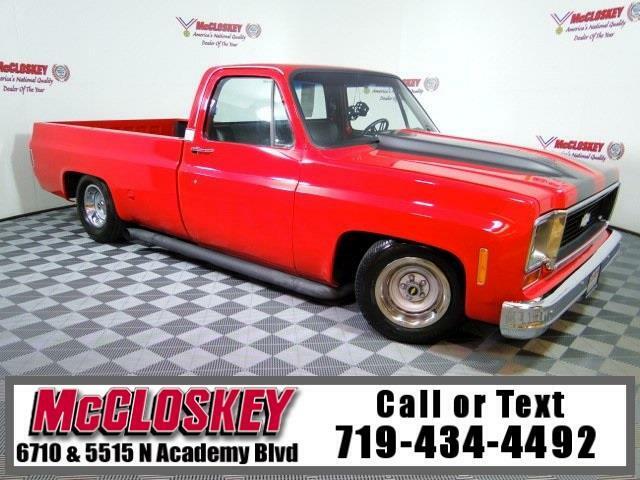 1974 Chevrolet C/K 10 Supercharged! Beautiful and well-built 1974 Chevrolet C/K 10 with Supercharger, Drag Tires, Custom Artwork Under Hood, Dual Fuel Tanks, Custom Exhaust, and Much More! Are you looking for a truck that looks as good as it sounds and runs like the day it rolled off the lot? This is the truck for you! This baby is all ready to hit the drag strip and do so in extreme style! Come see this beauty before its gone! This vehicle has been inspected in our shop and is in good condition for the year model, it's a strong running truck. We are an ''A+'' Better Business Bureau Rated Business. We offer low interest rate financing, low down payments and the highest trade allowances in the state! Here at McCloskey we do things a bit differently, we shop our competition every day to ensure a great value to you. Come on down and experience it for yourself. At McCloskey we strive to provide ASSURANCE, TRUST, VALUE AND QUALITY! Call 719-434-4492. Message: Thought you might be interested in this 1974 Chevrolet C/K 10.